As we dreamed and schemed about our around the world trip, countries in Asia rarely came up as places we wanted to visit. Destinations we'd been plotting to see for years like New Zealand, Australia and South Africa continued to top the list of must-see places. Countries like Thailand and Vietnam were second thoughts and added to the list purely because they would help our budget. Then we decided to volunteer and that opportunity led us to Cambodia. Now, mid-trip, it is likely that Asia will be the region where we will end up spending the most time. It has not disappointed. I never thought I'd live in an Asian country for three months. I never imagined I'd spend time in China and I never thought I could afford to spend weeks in Japan. But here we are - and so it goes. "China is the new center of the universe, the new Middle Kingdom. Mention China and experts spew superlatives. The country is skyrocketing in popularity, and the Chinese people are becoming the most sought-after tourists of the twenty-first century, spending lots of money and taking full advantage of their new ability to travel the world. The statistics point to even more record-breaking accomplishments. China will replace France as the most popular tourist destination in the world no later than 2020." We arrived in the early morning hours to a Shanghai that was sleepy with empty streets, fresh spring air and a warm sun. Our hostel was on the west side of the city near Zhongsan Park, tucked away down a small street and far from the chaos we had expected. We began to plan our day over coffee as we normally do - looking at a map and Googling things that looked interesting. And then we realized we were in China and trying to search for anything online in the country was going to be a challenge. Google isn't currently blocked in China, but a number of sites we would try to access wouldn't come up and we were blocked from things like Facebook and Twitter where I get many of my travel recommendations. So, we had to just take to the streets and act like we were back in the early 2000's when you relied on an actual map to find your way around. Shanghai is an extremely modern city since like most of China's cities, it was torn down and rebuilt in the last 30 years. Save for a few areas like the French Concession, the city is gleaming with skyscrapers, subways and tall apartment buildings. The biggest juxtaposition is along The Bund as it winds around the Huangpu River. 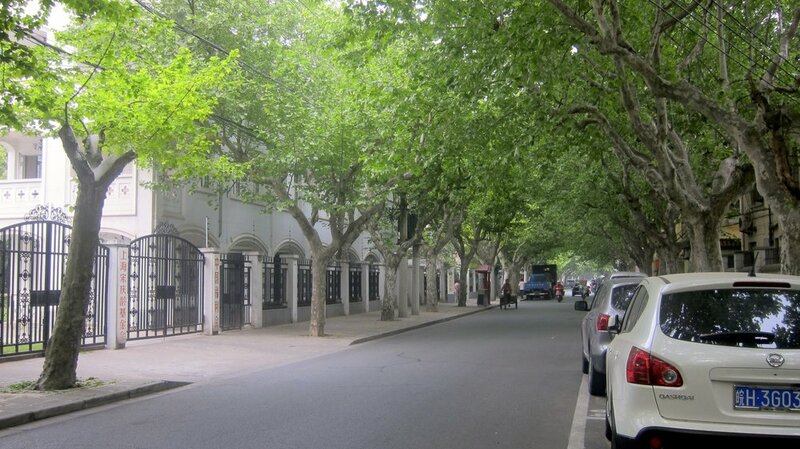 On the west side you have old, European influenced buildings lining Zhongshan Road. Across the river to the east is the Pudong District, flanked by bright lights, tall buildings and neon. It's a spectacular sight to see both during the day and at night. Pudong from the Bund during the day. Pudong from the Bund at night. For a glimpse into how the city came to be so modern, we spent a morning touring the Shanghai Urban Planning Exhibition Center, a five-story museum dedicated to showing how Shanghai's urban plan has created the city it now is. A complete replica of the city lines the third floor and its massive size and scale is dwarfing even with the miniature buildings. Before and after pictures tell the story of a Shanghai that looked dramatically different just 20 and 30 years ago. The before pictures reminded me of Phnom Penh and some of its less developed areas. The after pictures are New York City. The efforts of those who developed the new Shanghai put those of many U.S. cities to shame. Like all urban development though, the story lacks the tales of the residents who lived in those less developed areas. Where did they go? How did they feel about the changing city? Are they even in Shanghai anymore? A stroll through Zhongsan Park near our hostel continued to paint the picture of a city continually re-inventing itself. The large park that looked so inviting on the map was crowded with people outside its gates - dancing, singing, selling and enjoying the day. Excitement builds outside the gates of Zhongsan Park. We walked through the park's gates and were met by big white walls. The entire park was being razed and renovated. I'm still not sure how, or why, you would renovate an entire park at one time, but they were. In three days, we became captivated by what Shanghai has become and the potential of what may lie ahead. Like many others who become transfixed by China, we left with a new-found interest in understanding the gigantic country, its policies and the influence it will continue to hold over the rest of the world. Walking throughout the city was a breeze. The sidewalks are large, relatively clean (besides the spit from every other man who leaves his trace) and the road signs are in both Chinese and English. We rarely got lost or turned around and it was truly a pleasure to stroll along tree-lined sidewalks through numerous districts of the city. A street on the west side of Shanghai. We must have been there during a good time because the pollution in the city was not stifling as I imagined it would be. We rarely saw anyone wearing masks and I felt like I was breathing semi-fresh air for the first time in a long time after living in Phnom Penh. Among the modern facade, there remains the old habits of people. We saw men playing ancient board games along the streets, vendors selling turtles (not as pets) next to vendors selling underwear. Wandering off the main streets, there is still the bartering and selling of a typical informal economy. It was much more of what I expected to find in China. There are expats everywhere - university exchange students, businessmen and women and mothers strolling their newborns along the streets. A few of the expats are involved in the new craft beer scene in the city - one we were excited to explore after four months drinking light beers in Southeast Asia. Boxing Cat Brewing, The Brew at the Kerry Hotel, Shanghai Brewing and Dr. Beer are the major players in town. We spent an hour or so chatting with Leon Mickelson, the brewer for The Brew, who shared our love for great microbrews and travel, and let us sample some of his newest recipes straight from the kettles. Our favorites were the Single Hop at Boxing Cat and the creative, new brews from Leon, including an Imperial IPA. I think it's only a matter of time until the craft beer scene really takes off here. 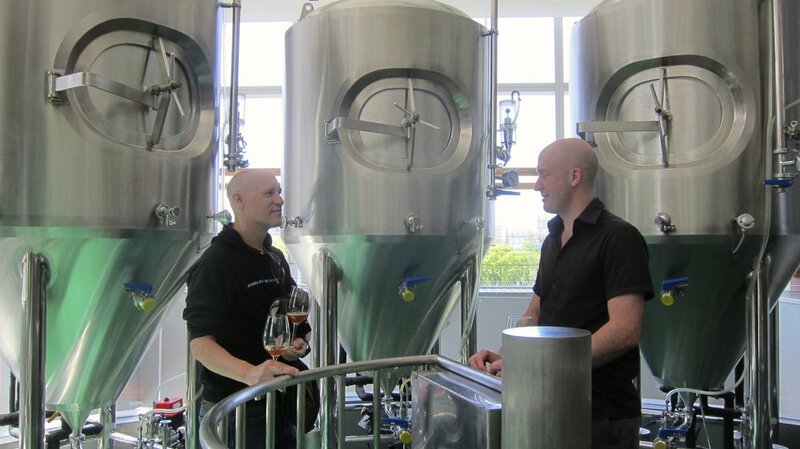 Dave and Leon talking about the new Imperial IPA. The city is a bargain in many ways. Trips on the subway are cheap - a day of riding the rails for both of us would be $3 or $4. Dumplings (our main food source for the trip) are really inexpensive at most places, usually less than $1 for four or six delicious snacks. It is possible to spend a lot more in the city, especially in areas like the French Concession where little bars, restaurants and boutiques line the streets. But if you want a bargain, it can be found. We almost cancelled our trip to Shanghai because of all the alarmist news on the new strain of bird flu in China. It didn't seem like a single person in Shanghai was concerned. I saw many more people wearing masks in Cambodia than in China. I'm so glad we didn't let the news scare us away from visiting and experiencing a bit of this country. Our tour through parts of Asia has been fascinating and I'm so glad we ended up spending so much time in this part of the world. I have a feeling we'll be back.